Another good entry of store and weanling cattle on offer at Lisnaskea Livestock Sales on Tuesday, November 20th sold to a brisk demand especially for quality stock. This week store heifers sold to £980 for 520kg Simmental and £975 for a 480kg Charolais. Store bullocks sold to £890 for a 440kg Charolais and £855 for a 440kg Charolais. Weanling steers and bulls sold to £850 for a 380kg Limousin with smaller ones selling to £700 for a 220kg Charolais (£318). Weanling heifers sold to £710 for a 260kg Charolais (£273) and smaller ones to £495 for a 220kg Aberdeen Angus (£225). Brookeborough producer 520kg Simmental to £980 (£188), 480kg Charolais to £975 (£203), 500kg Charolais to £890 and 500kg Belgian Blue to £830. Derrylin producer 380kg Limousin to £800. Magheraveely producer 490kg Aberdeen Angus to £790, 440kg Aberdeen Angus to £630 and 420kg Aberdeen Angus to £600. Maguiresbridge producer 440kg Charolais to £890 (£202), Lisnaskea producer 440kg Charolais to £855, 410kg Hereford to £755 and 410kg Shorthorn to £650. Magheraveely producer 450kg Aberdeen Angus to £805. Derrylin producer 380kg Limousin to £850 (£223), 360kg Limousin to £825, 310kg Charolais to £820 (£264), 310kg Limousin to £765 (£247), 330kg Charolais to £760, 300kg Aberdeen Angus to £600 and 240kg Aberdeen Angus to £585. Derrylin producer 360kg Limousin to £795 and 300kg Limousin to £735. Lisbellaw producer 330kg Simmental to £780 (£236) and 340kg Simmental to £720. Monea producer 280kg Charolais to £750, 260kg Charolais to £730 (£281), 270kg Charolais to £725, 250kg Charolais to £725 (£290), 260kg Charolais to £715, 250kg Charolais to £710 (£284), 240kg Charolais to £710 (£296), 230kg Charolais to £610 (£265), 230kg Charolais to £700 (£304) and 220kg Charolais to £700 (£318), Letterbreen producer 340kg Limousin to £730, 380kg Limousin to £690, 300kg Limousin to £645, 350kg Limousin to £640 and 270kg Limousin to £600. Fivemiletown producer 350kg Limousin to £730. Derrylin producer 300kg Charolais to £720, 310kg Charolais to £680, 300kg Aberdeen Angus to £580 and 250kg Charolais to £440. Derrylin producer 350kg Hereford to £705, and 310kg Limousin to £695. Lisnaskea producer 310kg Aberdeen Angus to £700, 280kg Aberdeen Angus to £590, 280kg Aberdeen Angus to £570, 270kg Aberdeen Angus to £570, 240kg Aberdeen Angus to £500 and 260kg, Aberdeen Angus to £480. Fivemiletown producer 270kg Charolais to £690. Magheraveely producer 310kg Aberdeen Angus to £690 and 320kg Aberdeen Angus to £600. Derrylin producer 240kg Aberdeen Angus to £590, 290kg Aberdeen Angus to £545, and 180kg Aberdeen Angus to £440. Magheraveely producer 270kg Simmental to £540. Derrylin producer 260kg Charolais to £710 (£273), 270kg Charolais to £705 (£261) and 240kg Charolais to £665 (£277), Tempo producer 360kg Charolais to £685 250kg Charolais to £655 (£262), 280kg Charolais to £595 and 250kg Charolais to £580. 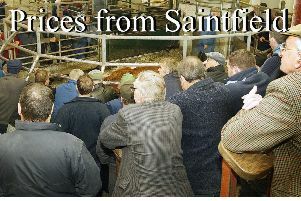 Derrylin producer 380kg Hereford to £635, 290kg Limousin to £505 and 260kg Limousin to £475. Magheraveely producer 250kg Limousin to £575 (£230) and 240kg Simmental to £520. Fivemiletown producer 270kg Charolais to £570, and 320kg Charolais to £640. Garrison producer 250kg Limousin to £560 and 290kg Limousin to £515. Derrylin producer 240kg Limousin to £505. Derrylin producer 220kg Aberdeen Angus To £495. More stock required weekly to meet demand.